It's no good, I just can't choose a favourite with these. I like the ergonomic, curling "J" and the simplicity of the "M" and "Q", but I also love the funky "L" and the impractical but playful "P". 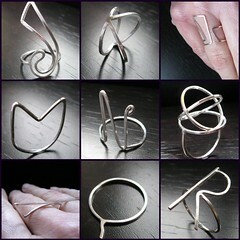 Taking a closer look at the shapes of letters has been great fun and could easily become an obsession. In fact, I'm starting to fret about finishing them. I may have to start all over again. Look forward to the next lot of rings have you any idea for another theme?